Robin Thicke dedicated his song Lost Without U to recently separated wife Paula Patton during his concert last night in a bid to win the actress back. 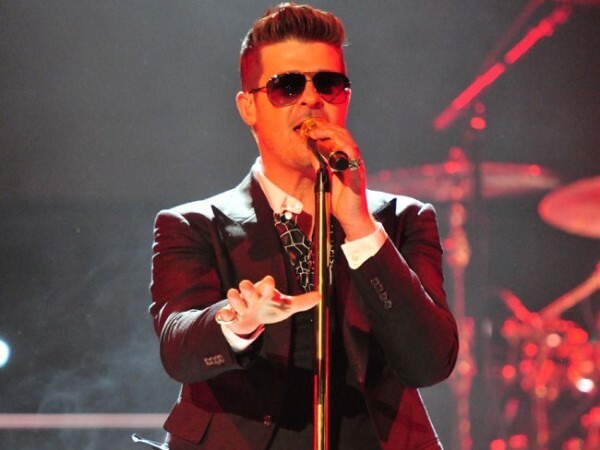 Robin Thicke has dedicated a song to Paula Patton. The Blurred Lines singer and his wife announced they have split after almost nine years of marriage earlier this week, but he appears to be desperate to win her back and even dedicated his 2007 hit 'Lost Without U' to her during his concert in Fairfax, Virginia, last night. Speaking to the crowd he said: "For y'all that don't know me and my wife separated, but I'm trying to get my girl back. She's a good woman." Thicke - who wore his wedding ring throughout the duration of the gig - told fans that he'd written the song for his wife before launching into an emotional rendition of the track. The 36-year-old singer-songwriter's tribute comes after he admitted he's willing to do anything to win the actress - who's the mother to his three-year-old son Julian - back. He said previously: "I'm just trying to get her back. You know. [I'm] just trying to figure it out, man." It emerged earlier this week that the couple had split following a series of rows about Robin's controversial behaviour, which kicked off with his MTV Video Music Awards (VMAs) performance which saw Miley Cyrus Twerking against him whilst wearing a tiny bikini.